BELIZE CITY–H.E. Mathu Joyini, South Africa’s High Commissioner in Jamaica, arrived in Belize this week for the celebration of Belize’s 33rd anniversary of Independence. 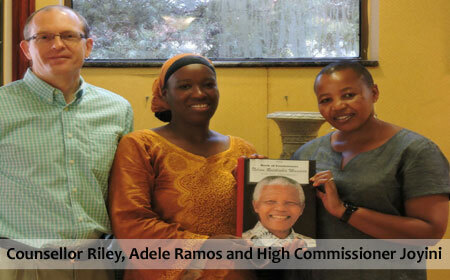 On the occasion of her visit, Joyini received the Nelson Mandela Book of Condolences, which was opened in Belize at the time of Mandela’s passing on December 5, 2013. Adele Ramos, assistant editor of the Amandala newspaper, who initiated the project when she covered the story of Mandela’s passing and realized that no such book was available for signing in Belize, presented the book of condolences to H.E. Joyini on Monday, September 22, at the Radisson Fort George Hotel in Belize City. Ramos told High Commissioner Joyini that Mandela’s impact was not only felt in South Africa, but across the world, and undoubtedly here in Belize. H.E. Joyini said that she would transmit the book of condolences to the Nelson Mandela Foundation in South Africa. An electronic copy of the book has also been remitted to the High Commissioner, along with news clips with the reaction of Belizeans to Mandela’s passing last December. The handing over was facilitated by South Africa’s local representative in Belize, Paul Martin.